Ainslie Meares was born in Melbourne in 1910. After graduating in medicine from Melbourne University, Dr Meares spent some time working at an army hospital treating soldiers who had been mentally disturbed by their war experiences. It was this exposure to the suffering caused by anxiety and the insightful link he made between anxiety and its relationship to physical illness that led him to dedicate his life’s work to the field of psychiatry. After the Second World War, Dr Meares continued practicing psychiatry but became disenchanted with cognitive treatments such as psychoanalysis as well as electric shock and drug therapy. A man of vision and always an innovator, he experimented and introduced numerous strategies and techniques within psychiatry, many of which have been absorbed into the general practice of psychiatry and psychology in general. In particular his expertise in clinical hypnosis brought success but within this aspect of his work Dr Meares discovered a new theory: some patients recovered with his assistance without deep-seated problems being resolved. He began to identify the reason for this as a different state of mental function which resulted in the body’s ability to naturally heal. In seeking to learn more about brain function Dr Meares travelled widely, witnessing and studying various mental states and the role these played in the lives of people from different cultures. These studies confirmed confirmed to him the importance of treating his patients for anxiety, illness and pain by allowing the mind to rest – in his view, enabling the homeostatic mechanism for the self regulation of the nervous system. While honouring the value of traditional meditation, from a medical perspective he originated a theory that differs significantly from meditation per se. His objective related only to assisting people in accessing simply the natural undisturbed calm within themselves through the facilitated therapeutic experience of stillness – or atavistic regression, a simple and more primitive meditative experience of absolute naturalness. This he described as the Atavistic Theory of Mental Homeostasis (The Management of the Anxious Patient: W.B. Saunders Company, Philadelphia & London, 1963). There comes an awareness of another dimension of our being. An awareness that’s not an awareness. An experience in which we are not aware of what we are experiencing. It concerns the spiritual aspect of our being. Spiritual. Nothing to do with religion. And of course, nothing to do with spirits. This is the third component of what we are. Have become quite familiar territory. Just glimpses, when our eyes are closed in meditation. Of this third dimension of their being. It has never come to those who directly seek it. Dr Meares was internationally recognised as a prolific author of some 30 books, among them the classic international bestseller ‘Relief Without Drugs’ (Great Britain: Souvenir Press Ltd, 1968), and over 100 medical papers, published in elite medical journals in Australia and overseas. He was a remarkable man whose innate knowledge and professional skills positively changed the lives of many people. He is owed a huge debt of gratitude. One of the many people whose lives Dr Meares assisted was Pauline McKinnon, whom he publicly acknowledged as an exponent of his distinctive meditation model. As Director of the Stillness Meditation Centre, Pauline has made the work of Ainslie Meares central to the services of the Centre and fundamental to our success. 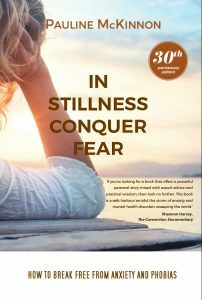 Pauline’s own story of recovery is described in her book “In Stillness Conquer Fear” and in 1983 Dr Meares wrote the Foreword to her first edition … click to read it here. Pauline’s later book, “Living Calm in a Busy World”, published in December 2011 presents a contemporary commentary on Dr Meares work, his theory and its significant benefits for modern living. In December 2011, to commemorate the 25th anniversary of Dr Meares passing, at the request of Pauline McKinnon and the Stillness Meditation Therapy Centre, the City of Melbourne placed a special plaque on a designated bench in the Fitzroy Gardens, Melbourne, where Dr Meares used to take his daily walk. The plaque reads “Sit quietly, for it is in quietness we grow” . We invite you next time you are near the Fitzroy Gardens, to take a few minutes out of your busy day, find Dr Meares bench and sit quietly for a while ….